Establishing processes promoting detailed documentation. The tradeoffs of the project’s starting point (should we start with abstractions or concrete components?!). How to speed up the development process using macOS frameworks. At this time we don't have UI designs for the app, and we lack a remote API for serving the remote feed items. We don't let the absence of parts of the system influence our productivity. We create contracts that serve as boundaries for our system to enable us to continue the development process. You can think of these contracts as the input and output of the components. For example, we know the specification of a FeedItem model and the remote API response. The remote API response is produced by the remote API (server/backend) and consumed by the RemoteFeedLoader (client/frontend). Thus, the backend and frontend developers can now work in parallel, as the contract they have agreed on describes how they will communicate. The same holds true between the UI module and the rest of the system. 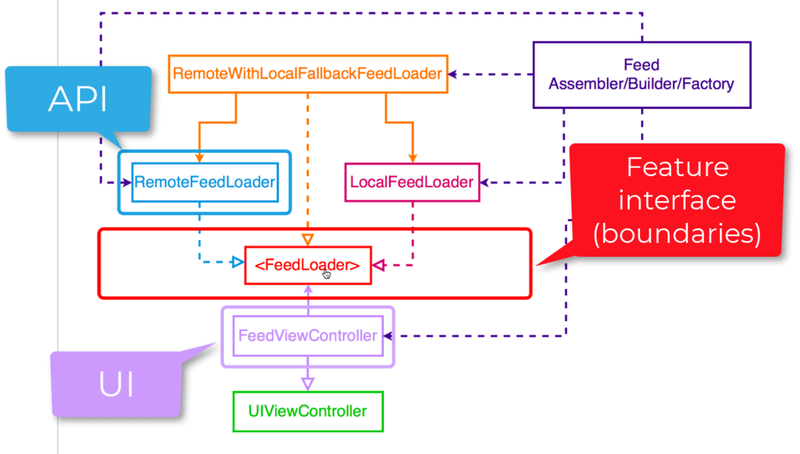 The UI needs an input of FeedItem's (to render on the screen), thus, as long as we describe an interface boundary (contract), we can continue developing in parallel without being blocked by the fact that we don't have a backend or the UI design yet. Once the backend and UI design are ready, we can compose all the modules together. Finally, since our components will be UI (and platform) agnostic for now, we create a new macOS framework which will help us expedite the development and testing processes, as we won’t need to run the app nor our tests on the slow iOS simulator. Subscribe now to our Youtube channel and catch **free new episodes every week** and follow the project's progress on GitHub.